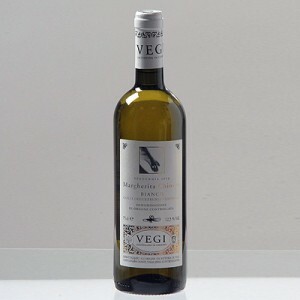 The first “Margherita Chiostri Colli Etruria Centrale DOC” (vintage 2007) was presented by Luca Maroni at Vinitaly 2008 as an absolute novelty in white wine. It is not comparable to the great white’s of Northern Italy (greater strength, structure, strength and resistance to aging) or to the typical Tuscan white (superior flavor, aftertaste and delicacy). AMPELOGRAFIC” BASE OF THE VINEYARDS: Mix between two native vines of the Chianti region TREBBIANO TOSCANO and MALVASIA DEL CHIANTI, with an expression of varietal grapes such as CHARDONNAY and SAUVIGNON BLANC. VINIFICATION: In stainless steel containers using the latest in modern technolog. TECHNIQUES OF AGING: To exploit the typicality of this white wine we do not use the barrel, but only a brief passage in Italian oak casks of 10 hl with an additional aging for a short period in the bottle, after which our white wine is ready for the glass. Our decisions here have resulted in obtaining a wine that combines the structure and body of Trebbiano, the alcohol and elegance from the Malvasia of Chianti with the scents and lightness of Chardonnay and Sauvignon. From this union comes a wine with a medium to high alcohol content, which, unlike many white wines gives its best even in the second year, characterized by strength, flavor with a delicate and fruity aftertaste. CHARACTERISTICS OF THE WINE: This rich and powerful wine Margherita Chiostri 2013 Cloisters is characterized by being straw-colored, soft and a slightly fruity fragrance, but also a strong and harmonious flavor. The character and body of Trebbiano enriched by the grace of savory and spicy Malvasia lightened by the carefree delicacy of Chardonnay along with the bittersweet scent of Sauvignon Blanc allows Margherita Chiostri 2013 to be an inviting appetizer, a raw material base for cocktails and a good companionship for various combinations: the classics: grilled or boiled fish, white pasta with fish. The most surprising, seasoned cheese, all cold first courses, spicy seafood (fish soup), the unexpected tomato-based pasta dishes, white and red meats, stewed, roasted, boiled and even bold fatty meats such as bacon, hams, salame, etc. Seeing is believing … For its particular flavor this wine should be served at a temperature slightly higher than that of a traditional white wine, that is between 12 ° and 14 ° C in summer and between 13 ° – 15 ° in other seasons.